The subprime mortgage industry collapse of 2008, which coincided with the U.S. recession, triggered enormous financial repercussions felt by millions of Americans. Unemployment doubled from five to 10 percent. The total wealth of an estimated 63 percent of Americans declined, with short sales and foreclosures skyrocketing. Non-business related bankruptcies peaked in 2010 at over 1.5 million. Fortunately, in the years since then, the economy has undergone a period of recovery, and more Americans are getting back on their feet financially. Bankruptcy is no longer the stigmatizing force it once was. The FHA allows for applicants to qualify for a loan after filing for chapter 13 bankruptcy 12 months later, contingent upon on-time payments in the past 12 months. A chapter 7 bankruptcy also brings about a waiting time of 24 months, following the discharge of debt, as long as the applicant has worked to re-establish their credit. Chapter 13 is a form of bankruptcy in which the individual agrees to make payments on their debt over a defined period; in exchange, they are allowed to maintain ownership of certain property. This bankruptcy usually involves consolidating debts into one lump figure. This form of bankruptcy is only open to individuals with a regular income. A payment plan is put in place that can last anywhere from three to five years. A person in a Chapter 13 can qualify for an FHA loan after making 12 on time bankruptcy payments. The court handling the bankruptcy must also provide approval for a purchase of a new home. Unlike chapter 13, chapter 7 is open to any individual, with or without a regular income. Different from chapter 13 as well is that companies can file for chapter 7. Known as liquidation, chapter 7 is categorized by property being sold off to satisfy creditors. This is used to discharge unsecured debts like medical bills and credit cards. Not forgiven are child support, alimony, student loans and certain taxes. 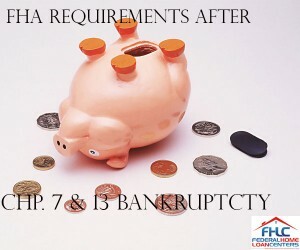 A person in a Chapter 7 can qualify for an FHA loan after 24 months from the date of discharge. During the 24 month time period the person must have re-established credit. To secure an FHA loan following a bankruptcy filing, the borrower must meet the standard underwriting requirements. Stable employment must be demonstrated, The previous 12 months of rental payments must have been made on time, and credit must be re-established. In 2014, The Department of Housing and Urban Development rolled out a new program that expedited the time an applicant had to wait, following a short sale, foreclosure or bankruptcy to qualify for a new loan. If a negative economic impact occurred due to extenuating circumstances outside of the borrower’s control, it is allowable to qualify for another loan in as little as 12 months. The crisis must have caused a reduction of household income by 20 or more percent for a period of at least six months. Acceptable circumstances include the death of a spouse who was the main household earner, serious illness, or natural disaster. To take advantage of this program, applicants must provide documentation that demonstrates the extenuating circumstances; such as a VOE, termination notice, business closure notice, tax returns and W-2 forms. Twelve months of satisfactory credit must have been established, and the borrower must attend mandatory counseling from a HUD-approved counseling agency. For more information contact Federal Home Loan Centers at 877-432-5626!